Do University Leaders Care About Teaching? 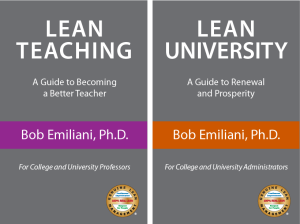 Since my books Lean Teaching and Lean University were published in June 2015, Lean University has sold at 2.5 times the pace of Lean Teaching. What might these sales results suggest? Sales of Lean University over Lean Teaching indicate that university leaders are more interested in Lean for administrative work than they are for academic work. It suggests a view that leaders prefer to focus on what is within their control (administrative processes) and ignore that which is outside of their control (academic processes). This is in spite of the fact that teaching (and learning) are the the core value proposition in higher education. It might also suggest that administrators care more about improvement than professors. Or, that administrators think that improving teaching is not possible, or that individual faculty are responsible for teaching and improving teaching, not administrators. Below is a recent e-mail exchange between me and a university president (slightly edited for clarity). It reveals an interesting divergence of views, and further confirms the general sense that university leaders seem to have little interest in improving teaching. Thanks for sharing a copy of Lean Teaching: A Guide to Becoming a Better Teacher. I remembered part of it because I think you shared this book with me once in the past but, perhaps, I am confusing it with another book that you sent [Emiliani note: The book sent previously was Lean University]. I enjoyed reading it, and found a number of interesting and well-taken points. Translating information from your background in Lean Manufacturing to the teaching and learning process is an interesting “overlay.” I think there is some real possibility here if you are ever interested in publishing with a major publishing house on this topic. In order to be able to do that, I think you would need to access a major amount of research literature on effective teaching and learning. Most of it emphasizes determining which practices have the greatest impact on the dependent measure being some form of assessment of learning outcomes. While your logical interpretations do fit a fair amount of that research, for example, there’s quite a bit of research on distributed learning and briefer content segments of teaching, guided practice, independent practice, and assessment and those effects on content learned, I’m not certain how well all of the tenets of Lean Manufacturing square with the actual research based on student learning outcomes. In any event, it was interesting reading, and I thank you for sharing it. I’m surprised that the significance of the 45 teaching errors (pp. 31-32) was not immediately apparent to you, considering they came from a survey of students like yours and given your focus on student success. Surely each one of the teaching errors compromise student success. (Your focus on the prestige of the publishing house was another interesting surprise. Appearance more important than substance… really?). In my 30+ years of industry and academic work experience, I have found that leaders often have great difficulty acknowledging the reality that the quality of the product or service the organization produces is average (inability to recognize problems that do not fit ones worldview). Is that the case here? Eliminating the teaching errors (which are ubiquitous, by the way) will do more to help assure student success than taking attendance and using the early warning system – which are two good things to do as well. Eliminating one’s own teaching errors show that you REALLY care about students. Wouldn’t you agree? Nearly every leader of a higher education institution would rather compete on the basis of campus attractiveness than the quality of teaching. It seems to me that leaders, such as yourself should emphasize to faculty the need to improve teaching as the primary means for improving student success. Eliminating the 45 teaching errors is a powerful first step. The Lean Teaching pedagogy is a practical method to further achieve that objective. Other methods may be helpful as well. Bob — I believe that much of what you said is true for many schools. Just take a look at the many different list of the top 100 schools in the country and you will see that teaching is not one of the top reasons the school is in the list. Fortunately I work for a small two year college that prides itself in educating its students; there are many opportunities at the school for continuing education for professors and lecturers to improve their teaching skills and programs to observe teacher practices as well as constructive feedback so teachers can learn. Thank you Bob for putting this out there. Hi Jim – It is good that some schools have more focus on teaching and, especially, improving teaching. This is more often the case for smaller schools than for the bigger schools. When one is small, the motivation to improve can be much stronger (and less bureaucratic as well).